Last weekend, in New South Wales, Australia, a man was captured on video assaulting a group of 12 year old boys at Goonellabah skate park in Lismore. It turns out that the man was defending his son, who was also 12, from a group of bullies. Prior to the incident, the bullies were so mean to the man’s son that they chased him away from the park. The boy later returned with his father, but the other children continued to mock and taunt the boy, even with the adult there. In the video, the father can be seen chasing after the group of children and knocking one child off of his scooter. He then grabbed the bully by the neck as onlookers yelled to leave him alone. The man then grabbed the scooter and knocked the bully over the head with it, and then turned to another one of the boys who was taunting his son. He used the scooter as a weapon on the second child as well, charging him with the object and pushing him backward. He then began throwing the children’s scooters around the park. *** BREAKING NEWS ***UNKNOWN MAN ATTACKS CHILDREN AT GOONELLABAH SKATEPARK*** Language & Violence Warning ***Do you recognise this man attacking children at the Goonellabah skatepark? Somehow, neither of the boys were critically injured, and were able to walk around coherently after the incident. Officers from Richmond Police District announced that they are investigating the incident. It appears that the suspect is still at large. Police are investigating an assault at a skate park in the state’s north at the weekend. 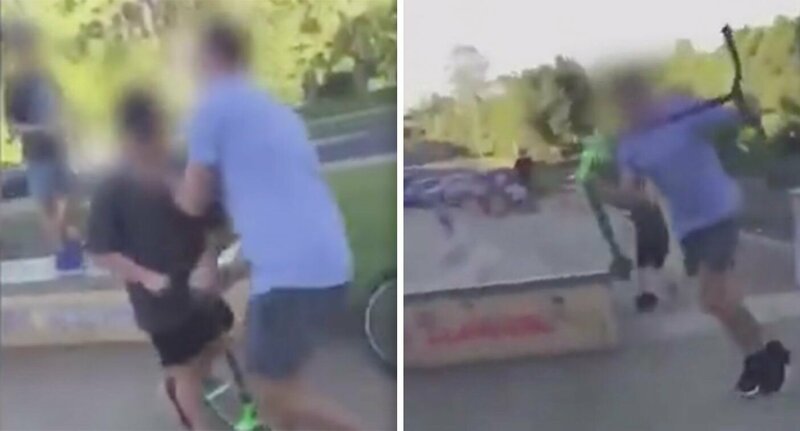 About 5.30pm on Sunday (31 March 2019), police have been told a group of 12-year-old boys were at a skate park in Goonellabah when they started to verbally abuse and threaten another 12-year-old boy. The youths allegedly chased the other boy up Simeoni Drive towards Ballina Street, before they returned to the skate park. The 12-year-old boy returned to the skate park with a man, believed to be his father, where the boys have taunted him again. The man allegedly assaulted one of the youths and threw his scooter. Officers from Richmond Police District were notified and commenced an investigation. Investigators are urging anyone with information to come forward. The internet is divided over this video with many people calling the man a thug and saying that he should not have resorted to violence. Others say that he is not teaching his son well by displaying such behavior. However, many others have defended the man, saying that he was teaching the bullies a lesson. Other local parents have spoken out, saying that the children in the video regularly terrorize the other kids at the park. “I take my kids there and all they do is abuse people. Last time I was there these same kids threw rocks and 3 teenagers on bikes until they left. Then rocks at their car as they drove off. These kids have no respect for anyone or anything. This guy needs a medal,” one parent wrote. “I wish there was a video of how these kids treat other kids and people in the area. Then others would understand that the father simply had enough. I do not condone his actions but fully see what drove him over the edge,” another said. “Don’t recognize that father,” wrote another, “but I recognize that lil’ [expletive] he’s attacking. They are the same kids been spitting on my son, and bullying my son, down that skate park. I’m not saying that father is correct or a hero, but I do understand his frustration because trust me, I’ve thought to myself about going down there and doing the same thing,” one parent wrote. Approximately one in four Year 4 to Year 9 Australian students (27%) reported being bullied every few weeks or more often (considered to be frequent) in a national study in 2009. Frequent school bullying was highest among Year 5 (32%) and Year 8 (29%) students. Approximately one in five young people under 18 (20%) reported experiencing online bullying in any one year. The figure of 20% has been extrapolated from a number of different studies which found rates varying from 6% to 44% of students. Peers are present as onlookers in 85% of bullying interactions, and play a central role in the bullying process. These figures are from Bullying No Way, an anti-bullying group based out of Australia.